quilting, cooking, art, history, nature. Halfway between Omaha/Lincoln & Denver. 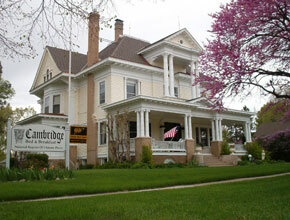 Recently named one of Nebraska's Hidden Treasures by Heritage Nebraska. We are pleased to be recognized by Only in Your State as one of the 14 Bed & Breakfasts Perfect for a Getaway! The masterful Neo-Classical architecture and original details of this grand three-story mansion inspires creativity and nostagia. Built in 1907 by a pioneer merchant, the home is preserved with faux hand-painted finishes, intricate millwork, stained and beveled glass windows, and original fixtures. Pamper yourself and sleep well in fine linens on quality beds. Enjoy rooms appointed with fine antiques, art, and books. Modern amenities include air-conditioning, telephones, free wireless high-speed internet, television, and private baths with showers. Business travelers will enjoy desk areas and early breakfasts available. Families may gather for reunions with activities nearby for all interests. The charming, friendly small town of Cambridge, Nebraska provides the perfect surrounding for a safe, relaxing, and fun-filled trip.Within walking distance you may enjoy nature and outdoor recreation, shopping, and many dining choices right here in Cambridge. Located just an hour south of Interstate-80, halfway between Omaha, NE and Denver, CO, you will arrive ready to relax after a pleasant four hour drive on historic US Route 6 & 34. We like to call Cambridge The Village on the Green to paint a picture of our beautiful small town bordered on the north and east with a lovely golf course and picturesque park, a tree-lined river on the south, and completely surrounded by natures scenic beauty and charming farms. The beautiful Medicine Creek State Recreation Area, just 10 minutes north of town, accesses 6,000 land acres of nature conserved and Harry Strunk Lake, a definite best-kept secret for enjoyment of all water sports with 2,000 acres of water and 29 miles of shoreline. Enjoy wildlife watching, unbelievable stargazing, and quiet relaxation.